Fine. Glued binding. B-format paperback. 384 p. In Stock. 100% Money Back Guarantee. Brand New, Perfect Condition, allow 4-14 business days for standard shipping. To Alaska, Hawaii, U.S. protectorate, P.O. box, and APO/FPO addresses allow 4-28 business days for Standard shipping. No expedited shipping. All orders placed with expedited shipping will be cancelled. Over 3, 000, 000 happy customers. New. Glued binding. B-format paperback. 384 p. In Stock. 100% Money Back Guarantee. Brand New, Perfect Condition, allow 4-14 business days for standard shipping. To Alaska, Hawaii, U.S. protectorate, P.O. box, and APO/FPO addresses allow 4-28 business days for Standard shipping. No expedited shipping. All orders placed with expedited shipping will be cancelled. Over 3, 000, 000 happy customers. I Know Who You Are is a deep and complex thriller with a sinister and dark undertone running throughout which culminates in an ending I did not see coming! I really enjoyed the use of alternating flashbacks to tell the story of Aimee's childhood to show you how she became the woman she is today. I liked the narrative voice of Aimee's younger self and how she was trying to work out what phrases and words meant in a scary and menacing new world. I also enjoyed how unsettled and confused you become as a reader trying to work out the facts from the fiction with this very unreliable narrator. The plot is nicely crafted and builds pace and suspense nicely, making you change your mind repeatedly about what you think will happen next. However, there were some writer quirks that I didn't like as much and the beginning few chapters almost put me off the book completely. Aimee starts off speaking in never-ending clichés which just felt cheesy and did little to put me in the right frame of mind to introduce me to the story. For example: 'It certainly changed our bank balance, but our love was already overdrawn'. Eurgh! Luckily these quickly calmed down. Alice Feeney also really enjoys segueing chapters together by tying the last phrase from one chapter to the first phrase of the next. Although this is used well in places, it started to get a bit tenuous after a while as she struggled to stretch to get to a link - it should have perhaps been used sparingly to give a better effect. 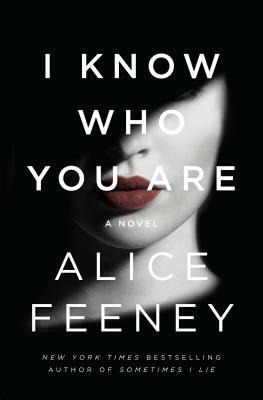 Overall I Know Who You Are is an extremely dark thriller that will keep you hooked and guessing throughout. Thank you to NetGalley & HQ for a chance to read the ARC in exchange for an honest review.